Montana Outfitting Company offers several lodging options for guests to stay – all in remote, peaceful settings with incredible mountain views from every angle and the only neighbors you will see are the wildlife and water fowl that call the area home. Guests are provided hearty home-cooked meals or can make arrangements to bring their own food. Faber Ranch Lodge located 30 miles from Big Sandy, MT offers guests a mountain lodge experience but with modern amenities! This lodge can accommodate a larger group. It has 4 bedrooms (each room is double occupancy) and 2 private baths as well as laundry facilities. It has an incredible great room with abundant seating for great conversation and comradery! Even though you are away from it all, you can reconnect if you choose to do so . . . we do offer excellent Verizon cell phone service, satellite TV, and Wi-Fi throughout the lodge. Click here to see more photos of Faber Ranch Lodge. Faber Ranch Lodge offers a large dining area and all meals are prepared by an experienced cook and served family style. The coffee is on when you wake up and a hot breakfast of items such as eggs and bacon, French toast or pancakes are likely to be served. Lunch is yours to create! We provide all of the sandwich makings... carved lunch meats, chips, fruit and home-baked cookies. After a day of hunting, you can expect a stick-to-your ribs dinner of something like fried chicken, meat loaf, pork chops, or steak. You’ll never go away hungry! *Meal items listed are just examples of what may be served. These items can vary based availability and the cook’s discretion. Flying: Guests staying at Faber Ranch Lodge or Eagle Creek Lodge can fly into Great Falls, MT. MOC personnel will arrange for airport pick up. Great Falls is located approximately 110 miles from Eagle Creek/Faber Lodges. Cape Air also services the area flying into Havre, MT which is approximately 60 miles from the Faber Ranch Lodge. MOC will provide airport pickup. For more information on available flights, contact Cape Air at 1.800.227.3247. Driving: Click here to download driving instructions for Faber Lodge. Eagle Creek Lodge is also located approximately 30 miles from Big Sandy, MT. It is a quaint, chalet-style cabin that has a bedroom on the main floor and a beautiful log staircase leading to a sleeping loft. Eagle Creek has a kitchenette and accommodates up to 3 people with 1 private bath. There is also a bunk house in very close proximity where 2 additional guests can stay comfortably. At this lodge, you are truly away from it all and surrounded by nature at its best! There is no Wi-Fi or cell service at this location. Click here to see more photos of Eagle Creek Lodge. There are cooking facilities in the Eagle Creek location, so it is possible to bring and prepare your own food. However, it is just a short driving distance from Faber Ranch Lodge, so guests can easily have their meals served family style in the Faber Ranch Lodge. Flying: Guests staying at Eagle Creek Lodge can fly into Great Falls, MT. MOC personnel will arrange for airport pick up. Great Falls is located approximately 110 miles from Eagle Creek/Faber Ranch Lodges. Driving: Click here to download driving instructions for Eagle Creek Lodge. 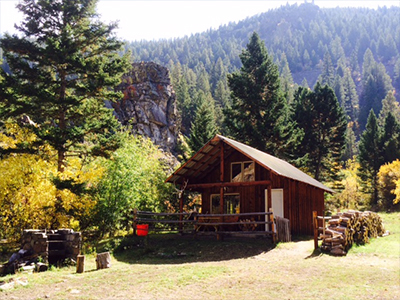 This remote, rustic/primitive hunting lodge is located on private ranch lands in the mountains near Boulder, MT. 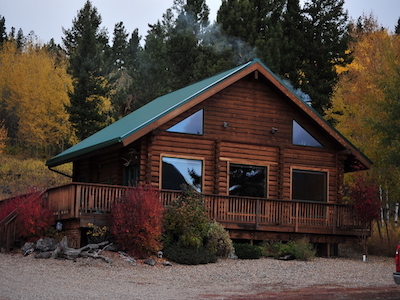 Boulder Lodge is available for elk hunts only. This off-the-grid cabin has a sleeping loft that will accommodate 4 and guests have the option of bringing in their own food or having it prepared. There is no running water at this location, the lodge power comes from a generator and rest room facilities are port-a-potties. There is no Wi-Fi or cell service at this location. Click here to see more photos of Boulder Lodge. There are limited cooking facilities in this location (Coleman 2 burner stove and potable water). Guests can bring in their own food or have it catered. Catered meals are always abundant and are prepared by the guide’s wife, cooked at the location and served family style. Breakfast is usually foods like cereal, eggs and hash browns with breakfast meat, French toast, pancakes or breakfast sandwiches. Guests will be responsible for making their own lunches with a variety of fresh sandwich fixings provided. A hearty dinner is prepared in the evening -- foods such as chicken, pork loins and steak accompanied by a salad and homemade dessert are examples of what is likely to be served. *Meal items listed are just examples of what may be served. These items can vary based on availability and the cook’s discretion. 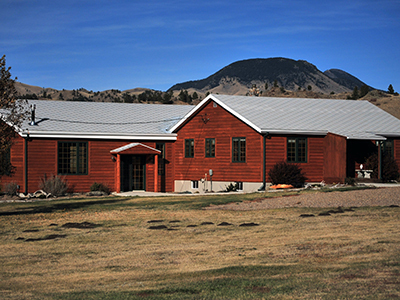 Flying: Guests hunting at our Boulder, MT Lodge will need to fly into Helena, MT. MOC personnel will provide transport to/from the airport. Driving: Guests who are driving should contact their designated host once they get to Boulder, Montana. The host will provide instructions to the Boulder Lodge.